Today’s interview finds me chatting with Charla Gabert who, like Joanne Cooper, made her way back to writing by way of art; in Charla’s case, mosaics. As a child, Charla “disappeared into books,” so it was only natural that she would write poems and stories and work on her high school literary magazine. She even went on to get a master’s degree in creative writing, but when earning a living became a challenge, she got a degree in communications management and used her writing skills in the corporate world, where she forged a career as a writer and editor in marketing communications. Over time, Charla says, she gave up on her creative writing and slowly stopped thinking of herself as a creative writer. But then she ran into former fellow Brown student and author Elizabeth Rosner. They got to talking, and when Charla mentioned that, though she wasn’t currently writing, she’d once been accepted to Stanford’s MFA program, Elizabeth Rosner said, “What can we do to get you writing again?” A question that reminds me so much of the ways women encourage each other to keep going, to keep writing, and by extension to rescue their voice—and their story—from silence. So, she enrolled in a mosaics class, instead, and it was here that Charla tapped back into her creativity and began what ultimately became a creativity practice—a discipline that returned her to her creative well, which she ultimately transferred back to her writing. Indeed, Charla draws fascinating parallels between the artistry of creating mosaics out of “pieces” and piecing together parts of a memoir story. At the heart of Charla’s interview is the theme of acceptance and the role our subject—and, more to the point, our relationship to our subject—can play in how we show up for our writing. Accepting one’s subject—the subject that wants to be written—can be a watershed moment in a writer’s experience, especially if she’s spent a good part of her life resisting her subject. Charla’s experience sheds light on just how profound acceptance of your subject can be. Once she realized her subject was her parents’ divorce—divorce was shunned in the 1950s and 60s when Charla was growing up with a single mother, so she, too, had learned to shun it—she began the process of accepting it as her subject. Isn’t that a kind of magic? By accepting her subject through the writing process, Charla ultimately came to accept herself and recover her voice. “I took this pain and made something beautiful out of it,” she says. You’ll hear this beauty firsthand when she reads from a memoir piece about her eight-year-old self facing the inevitability of loss as a perennial human condition for the first time. I dare you—just dare you!—to come away from her reading without its final image resounding in your heart! I came away from our conversation deeply humbled by the power of our subjects to “wait” for us to finally meet them—and by extension ourselves—on the page. Oh, and in the interview, I share a description of a mosaic Charla made for me while I was out on medical leave with breast cancer a couple of years ago. 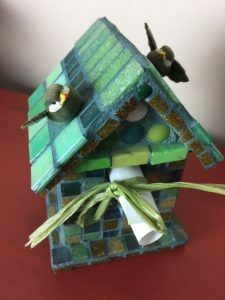 Here’s a picture of the mosaic—a birdhouse with Emily Dickinson’s poem “Hope is the thing with feathers” inscribed on the bottom. Ready to begin your own conscious writing journey? Excavate Your Truth/Free Your Voice: A Conscious Writing Journey for Women Who Are Done with Silence is open for registration! Visit the course description and registration page here. Charla grew up in Missouri and Memphis. She went to Brown University, where she studied writing and communications before getting a master’s degree in creative writing from Johns Hopkins and another master’s in communications management from Simmons College in Boston. After twenty-five years in marketing and communications in the tech industry, Charla became a mosaic artist and has been making mosaics for ten years. She is married, and she writes and lives in California near San Franciso. She does not have children but she does have one cat. 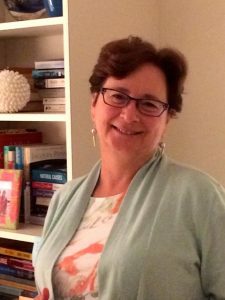 Conscious Writing Interview ~ Pamela Sampel: "I'm doing it anyway, dammit!"